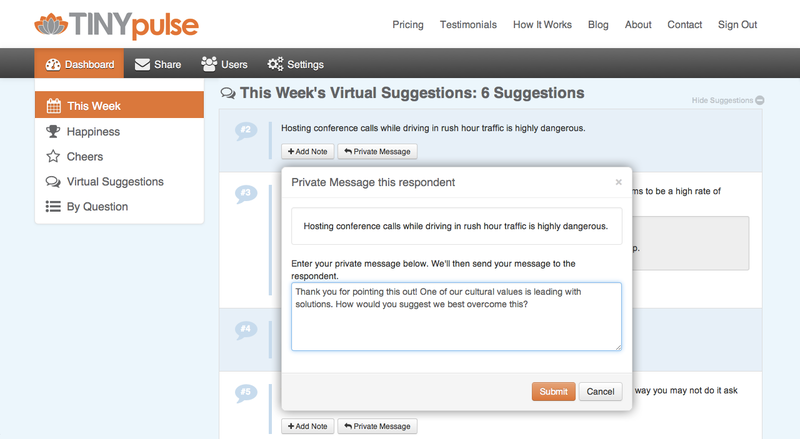 TINYpulse provides a weekly survey to over over 300 companies around the world. After analyzing over 40,000 anonymous responses, we uncovered important workforce trends that we haven’t seen in the popular press. The data reveals vital learnings about how employees feel about their organizations’ culture, management, recognition, and their fellow co-workers. Since our mission is to “make employees happier,” we wanted to share the results and data so that organizations can engage their employees, and it doing so, they will improve their bottom line. In addition to the data, we have provided company case studies, video and social media insights to show the stories behind the trends. Only 42% of employees know their organization’s vision, mission, and values. That’s an alarmingly low number. Too many executives are not communicating and reinforcing their company’s guiding principles and mission. 82% of respondents claimed that their manager clearly outlined their role and responsibility. At the day-to-day team level it seems that managers are able to effectively set expectations and accountability. Employee happiness is more dependent on co-workers than direct managers. Employee happiness is 23.3% more correlated to connections with co-workers than direct supervisors. There is a very strong correlation between employee happiness and their rating of co-workers with a .92 correlation coefficient compared to a .74 correlation coefficient between employee happiness and how they rate their direct supervisor. Team play and collaboration are the top trait employees love about their co-workers. In the recruitment and interview process, leading companies must incorporate opportunities to test and screen for these vital characteristics in candidates. 18% of responses included a suggestion, and organizations that don’t promote employee suggestions are at an innovation disadvantage. Businesses that don’t crowdsource innovation and suggestions from their employees are missing a huge opportunity. If you’re relying on an open door policy, then you’re not fully leveraging your most prized asset - your people. 36% of responses provided peer-to-peer recognition which proves that a lightweight and regular system boosts intra-organization recognition. As organizations become more decentralized, virtual, and matrixed, there’s a growing need to provide regular recognition that goes beyond the antiquated one-on-one supervisor-to-employee relationship. 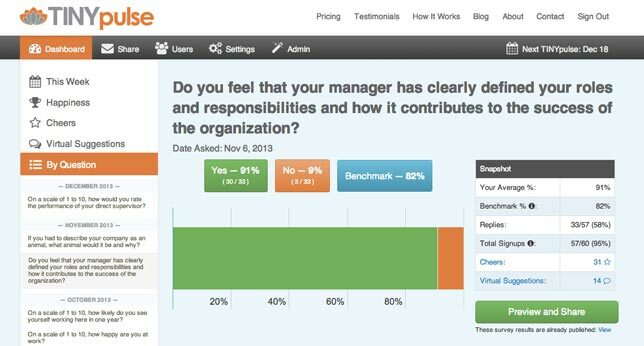 Management transparency is the top factor when determining employee happiness. This finding surprised us too, with management transparency coming in at an extremely high correlation coefficient of .93 with employee happiness. The cost of improving transparency is almost zero, but requires an ongoing dialogue between management and staff. We see an increasing number of companies using transparency as a weapon to attract and retain top talent. The role of co-workers in employee happiness continues to grow along with the need for increased transparency. Investors and efficient capital markets demand transparency and employees want the same from their leaders. 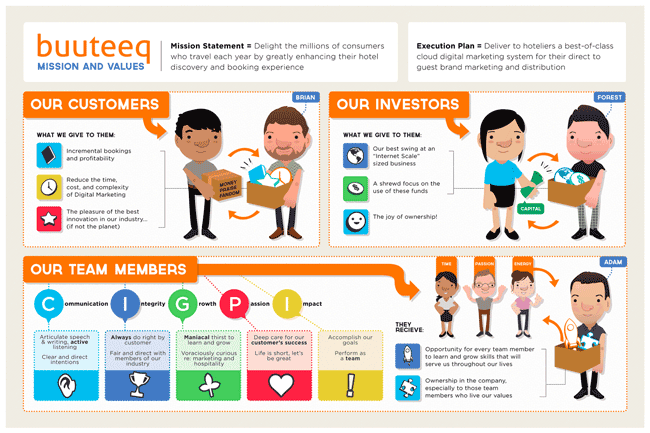 An important part of transparency, is the communication and understanding of the company’s vision, mission, and values. As the workplace becomes increasingly flat and decentralized, this puts a premium on stronger employee-to-employee relationships. HR and team leaders must prioritize recruiting talent that is collaborative and team-oriented. Consequently, these trends dramatically shift the balance in favor of companies that respond effectively and rapidly. The annual employee survey is no longer adequate for the on-demand, real-time world we work in today. Listening to and acting on employee feedback is being deployed as a continuous process by many leading companies. Let the voice of the employees ring in all of our ears, for each one of us plays a role in driving the employee engagement to grow your bottom line. 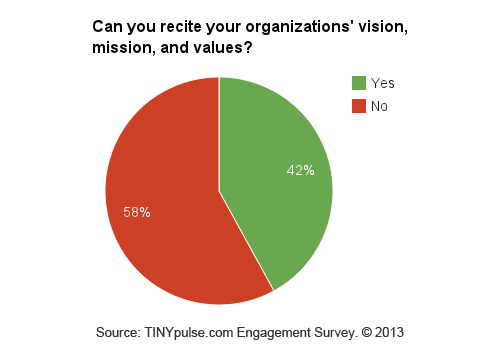 Only 42% of employees knew their organization’s vision, mission, and values. We all know that the clearer a goal is, the better the chance that it will be achieved. So it was surprising to find that less than 50% of employees from companies around the world know their organization’s vision, mission, and values. Those who say the company's values are "known and understood" are 30x more likely to be fully engaged. Some organizations candidly admit that they don’t even have a formulated version of their vision, mission, and values. Yet like it or not, when a company forms, a culture also takes root and grows to what it is today. 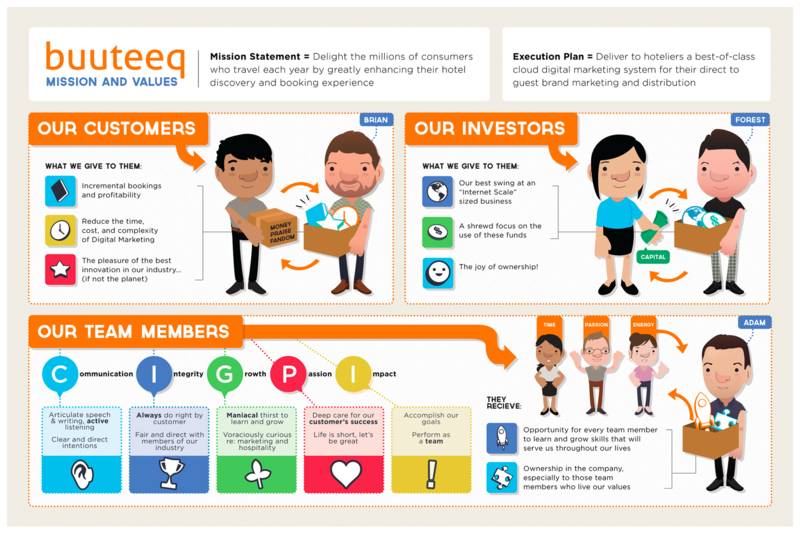 When Buuteeq Founder and CEO, Forest Key, started using TINYpulse, he was surprised to find out many employees couldn’t recall the vision, mission, and values of the company. Hear his candid confession (0:36 mark) and his response. 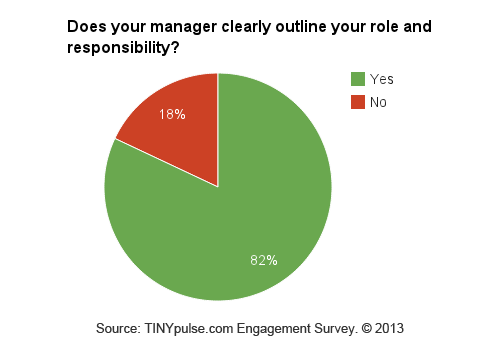 82% of respondents claimed that their manager clearly outlined their role and responsibility. At the team levels, managers are doing a good job clearly outlining roles and responsibilities for employees. In fact, over 8 in 10 employees feel that their manager clearly outlines their role and responsibility. However, these same managers aren’t as effective linking individual goals to the organizational vision and mission. Or they may just be part of an organization where the vision, mission, and values aren’t defined. The opportunity for breakout performance throughout the organization is aligning individual and collective goals, vision, and values. Jeff Hu, CEO of Atomic Recruitment, carefully monitors feedback from his team. He actively shares results back, and he praises his staff when they outperform benchmarks yet knows that they can still improve. Employee happiness is more dependent on co-workers than direct managers. The employee’s rating of their relationship with co-workers is very strongly correlated with how happy they are at work with a correlation coefficient of .92. At the same time, the correlation between employee happiness and their rating of their direct supervisor is less significant at .74. We often think of employee happiness and satisfaction as being manager-driven, but now as the workplace becomes more cross-matrixed, collaborative, and "bottom-up,” the importance of co-worker relationships continues to grow. Employee happiness is 23.3% more correlated to connections with co-workers than direct supervisors. A 2013 SHRM study also showed that the relationship with co-workers was a more important factor than the relationship with immediate supervisor when it came to employee engagement. The study also highlighted that this is a growing trend with the importance of the employees’ relationship with co-workers increasing from 76% in 2011 to 79% in 2012, while the importance of the employees’ relationship with their immediate supervisor dipping from 73% in 2011 to 71% in 2012. We’ve all heard the passage that “people quit their bosses, not their job.” That may be true in the past but this is becoming less and less so. 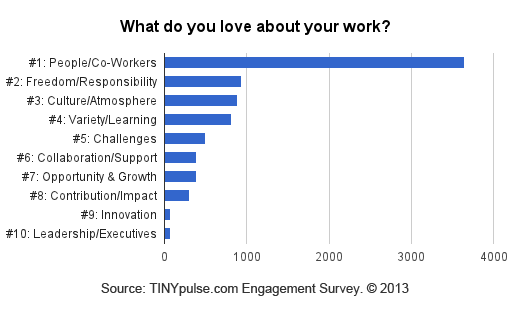 When we asked “What do you love about your work?” the responses overwhelmingly focused on an employee’s immediate team and colleagues. That was the the #1 response by far. In a distant 10th place were that employee’s leaders and executive management. The implications of this trend are profound and suggest that every person in a company plays an important role in the health and happiness of a vibrant employee culture. It’s not just the CEO and one’s manager anymore. Just like every member of a football team plays an integral role to the success of the overall team, each team member means even more to the other team members than the manager does now. This trend demands that organizations have a constant feedback loop to determine how employees are feeling and where the strong and weak links are. Employee surveys conducted once-a-year fall woefully short of accomplishing this. Therefore HR must lead the charge with management to conduct, analyze, and take action against the results of these ongoing surveys. Team play and collaboration are the top trait employees love about their co-workers. Building upon the previous finding on what people love about their job, we wanted to understand the characteristics that comprise a great colleague. 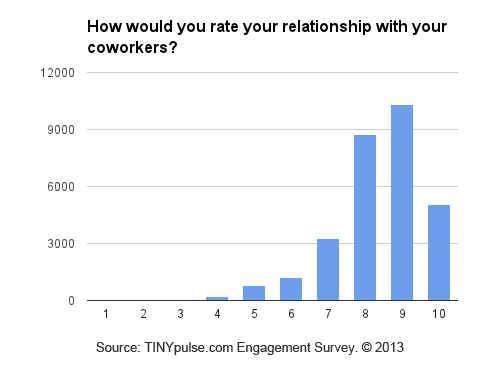 First, we looked into the results of this TINYpulse question, “On a scale of 1 to 10, how would you rate your relationship with your coworkers?” (1 being extremely poor and nonexistent — to 10 being awesome and love them). The results below show that most people believe they have a good working relationship with their co-workers. We discovered that employees who rate their co-workers and their relationships with them highly tend to be happier at work. The converse is also true, employees who were less happy also tended to rate the relationship with their co-workers lower. So if co-workers play a big role in employee happiness, what are the important elements and traits people look for in their colleagues? Teamwork plays a much bigger role, and is mentioned over two times more than the next set of factors around talent, attitude, and fun. This provides a blueprint for smart HR and executive teams to screen and hire for these these traits to create a group of high performers that attract and retain other high performers. 18% of responses included a suggestion, and organizations that don’t promote employee suggestions are at an innovation disadvantage. Crowdsourcing is a powerful trend that is materially impacting how businesses and societies operate. From creating logos to aggregating knowledge to highlighting traffic jams to forecasting weather to even funding businesses today, we are just starting to scratch the opportunity to leverage crowdsourcing. But one of the easiest and most overlooked opportunities is to crowdsource ideas and innovation from within our own organization. How many corporations survey their customers for feedback on an ongoing basis? Compare that with how many of those same corporations survey the talent they so assiduously screened and hired. There’s no more hiding behind an open-door policy or polling one’s team once a year. 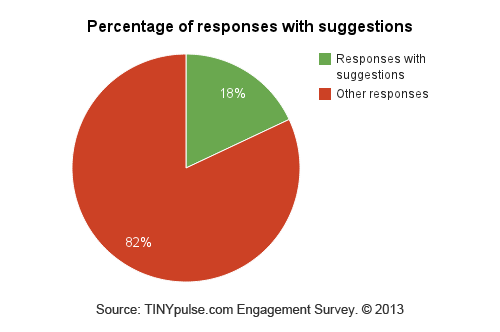 Given the opportunity to provide suggestions on an ongoing basis, 18% of responses did so. Who is providing the suggestions? We segmented the data further to identify who provided more feedback: self-reported happier employees or self-reported less happy employees. 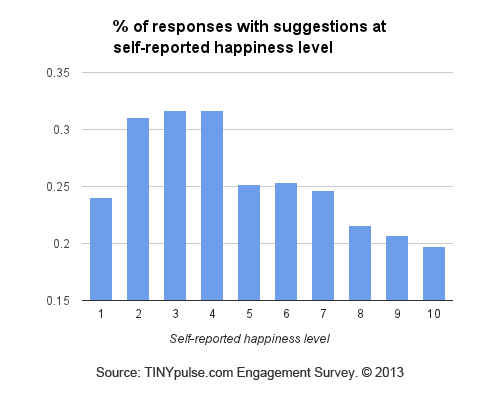 The suggestion rates are highest when employee happiness is low at a 2, 3, or 4. Then it drops dramatically at 1. At a 1, you could say that these employees have essentially given up. However, at a 2, 3, or 4, the employee is still motivated to share their unhappiness in hopes of positive change and action. Most surprising is that the happiest employees provide the lowest rate of feedback. This does not mean that silence is golden nor should these happy employees be taken for granted. Managers need to be even more proactive (through multiple channels) to tap into the knowledge, concerns, and suggestions of their staff - especially the happiest ones who are the least vocal with suggestions. In the example below, one employee suggests that conference calls should not be held during rush hour traffic for safety reasons. Providing both anonymous feedback and 2- way communication enabled the executive to both acknowledge the issue and engage the suggestion provider for a solution. The same employee provided the initial suggestion also came up with the eventual solution. 36% of responses provided peer-to-peer recognition which proves that a lightweight and regular system boosts intra-organization recognition. Another trend significantly impacting organizations is the rise of decentralized, virtual, and matrixed teams. Along with this new paradigm is the opportunity to also decentralize recognition beyond the antiquated one-on-one supervisor-to-employee relationship. 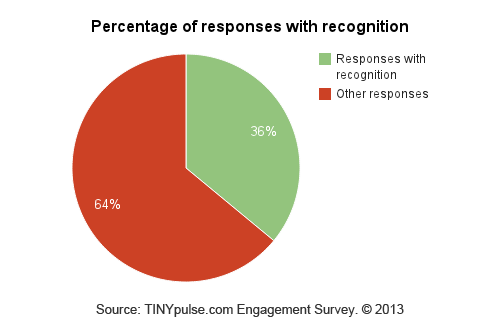 When responses to TINYpulse surveys are submitted, a whopping 36% of responses also included a “Cheers” for another colleague. On top of that, we all know that we should give more recognition because it facilitates and promotes so many positive responses. But most people rarely dedicate the time to pass on written recognition, which is so impactful to the recipient. Just received my first @TINYpulse cheers it couldn't have come at a better time! If only I knew who sent it, I'd like to give them a hug! It’s so meaningful to some recipients that they share it publicly via Twitter and other social media channels. In addition, giving more recognition costs nothing! It’s just the time it takes to provide thoughtful Cheers. Implementing a lightweight and regular system to facilitate the giving of recognition significantly is a must have for any organization that wants to up-level their internal morale and culture. 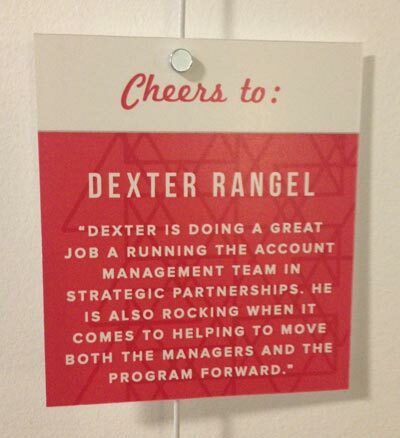 Employee Cheers come to life at Wpromote to enhance their culture of appreciation. It's also a bold statement to potential new hires and clients. Michael Mothner, CEO of Wpromote, and his staff love the ease of giving and receiving recognition via TINYpulse. It’s had such a positive impact on his culture that they’ve created physical plaques that highlight Cheers for Peers. 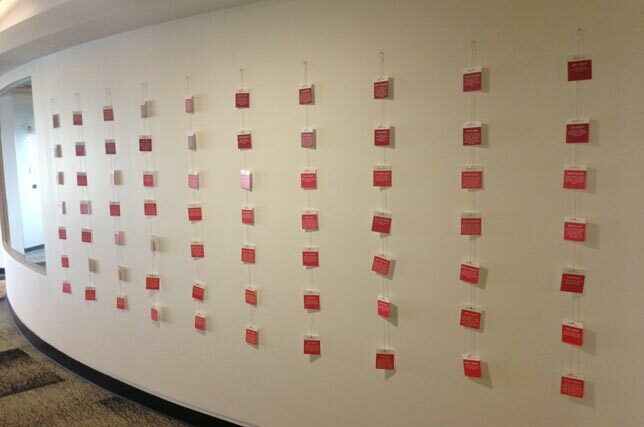 These hang in their lobby and are a great reminder of the fantastic culture of appreciation that occurs at Wpromote. It’s also a great recruiting tool for both talent and clients. 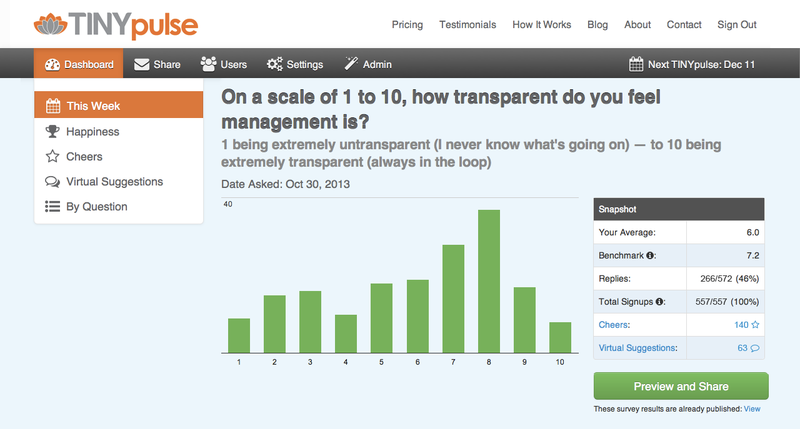 Management transparency is the top factor when determining employee happiness. Numerous articles give advice on what employees want by offering top-down anecdotal stories and advice. Just look at the top Google results for “what do employees want”. Our research unveils something we did not expect nor have seen backed by research in the popular press. There is a very strong relationship and correlation between an employee’s self-reported happiness level is and the transparency of management. Rating of co-workers and team members, relationship with co-workers, and effectiveness of responding to feedback also correlated highly to employee happiness but transparency of management came out on top. Learn more about the definition of correlation coefficient and our research methodology. In Warren Bennis’ book, Transparency: Creating a Culture of Candor, he says, “studies show that companies that rate high in transparency tend to outperform more opaque ones.” He cites a 2005 study finding that a group of 27 U.S. companies noted as “most transparent” beat the S&P 500 by 11.3%. Transparency is not only good for employee happiness but also great for the bottom line. Every organization should be thinking about how they can be more transparent. It is one of the lowest to no cost initiatives to tackle right away. But of course, it requires an ongoing commitment from management to be more transparent to the very people they so carefully brought onboard. At the end of the day, to give is to get. CEO finds blind spot and then challenged team to "Ask us anything." The results were overwhelming positive. He relayed that his team was extremely grateful and that the response was overwhelmingly positive. But he would not have been able to identify this issue without a regular cadence of surveying his employees and addressing blind spots. They are such believers in transparency that they also use this for attracting and retaining top talent. The chart below is what they share publicly to potential recruits. As the competitive landscape changes, it has dramatically shifted the balance in favor of companies that can respond effectively and rapidly. Organizations must do a better job of sharing their vision, mission, and values along with aligning it to employee-level goals. With a more decentralized work environment that puts a premium on employee-to-employee relationships, HR and team leaders must prioritize recruiting talent that are extremely collaborative and team-oriented. To harness the crowdsource wave, systems must be implemented that are lightweight and easy to use for employees to be able to provide suggestions and peer-to-peer recognition. Finally, investors have demanded increased transparency from corporations--and employees want the same from their leaders. We have carefully aggregated, analyzed, and vetted the results from 40,000 plus responses. The findings may not necessarily reflect your organization’s realities. As you know, every company is unique and must take the time to consistently get a pulse on their employees, facilitate recognition, and solicit feedback. If you and your organization are ready to commit to change, with the patience to benchmark, take action, and improve, then contact us here to see if we can help make your employees more engaged. Happier employees make bottom line business sense. The correlation coefficient is a measure of the strength and direction of the linear relationship between two variables. A correlation greater than .80 is described as strong, whereas less than .50 is generally weak. Specifically we used a Pearson’s “r” correlation coefficient which is a measure of the linear correlation between two variables. This study analyzed over 40,000 survey responses from 300 plus organization between September 1, 2012 and November 15, 2013. In particular, the statistical correlations on employee happiness were based on the responses of over 150 companies between September 1, 2012 and June 30, 2103. Ryan McCune - Data scientist consultant. Ph.D. Candidate, University of Notre Dame. B.S., University of Notre Dame. Kevin Nakao - Consultant. M.B.A., Harvard Business School. B.A., Whitman College. A special thanks to the following people who also assisted in the development and production of this report: Zach Hale, BJ Shannon, Jimmy Winskowski, Stephen Becker IV, Christina Key, Alice Niu, Dharmendra Ahuja, Adam Lind and Jason Wong. TINYpulse helps leaders get a pulse on how happy, frustrated, and burnt out their team is before retention sinks and issues become cancerous. TINYpulse is a cloud-based software-as-a-service that has revolutionized the annual employee survey by breaking it down to one question per week pulses to help leaders react quicker and gain insight into the health of their organization. The service also features virtual suggestions, an anonymous messaging system for employees to speak candidly with leaders, and Cheers for Peers, a peer-to-peer recognition feature that allows all employees to provide gratitude to their colleagues. TINYpulse helps hundreds of clients all around-the-world, including Amazon, HubSpot, San Diego Gas & Electric better engage their employees. TINYpulse, of Seattle WA, was started in 2012 by David Niu, who previously founded NetConversions (sold to “AQNT”) and BuddyTV. Niu recently sold everything and traveled around the world with his wife and then-10 month old daughter. Along the way, he interviewed entrepreneurs about best practices and pain points around managing people, leadership, and culture. Upon returning, David focused on what he learned from these global business owners to develop TINYpulse with the goal of providing leaders a pulse on how happy, burnt out, and frustrated their employees are so that they can build bridges to spark dialogue for positive change. 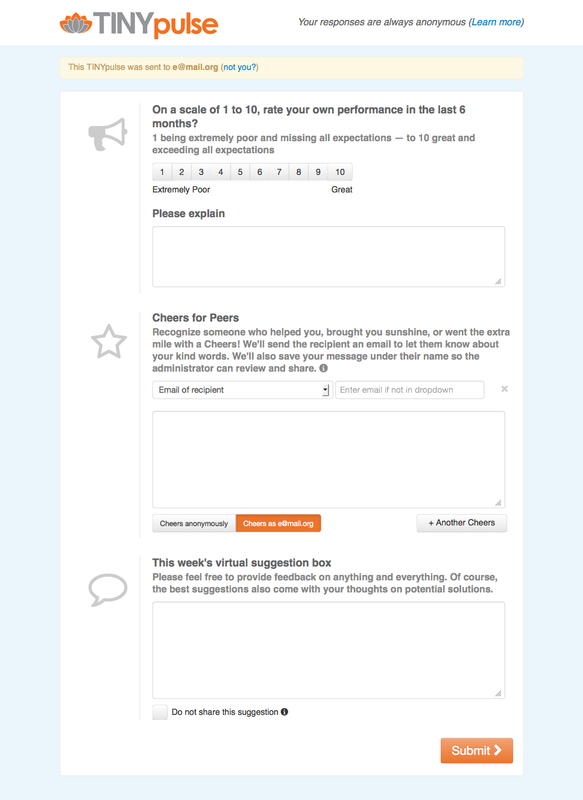 The following is a screenshot of the administrative dashboard that the executive and / or HR see.